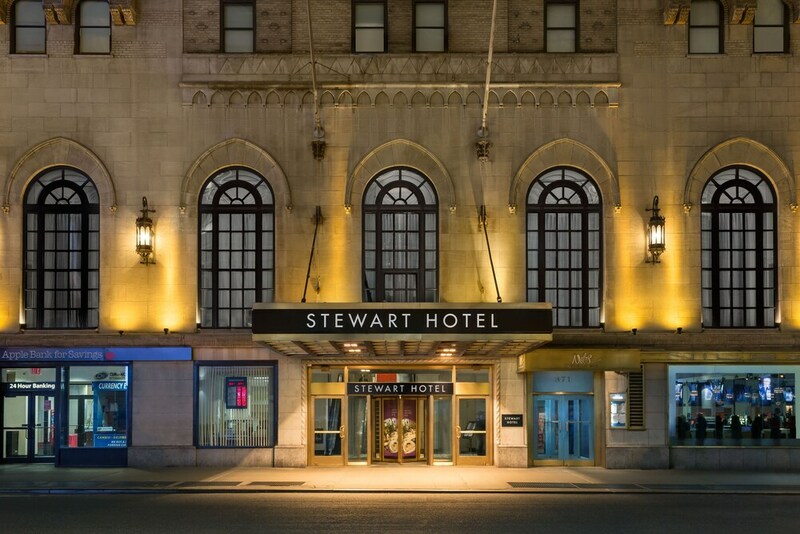 Located in Midtown, Stewart Hotel is within a 10-minute walk of popular sights such as Macy's and Herald Square. This 618-room, 4-star hotel has a restaurant, a fitness center, and a 24-hour business center. Enjoy a bite to eat at the hotel's restaurant, or relax with a drink at the bar/lounge. Order from room service to satisfy your hunger without leaving your room. Cooked-to-order breakfast is offered for a fee each morning from 7 AM to 10 AM. A Smart TV comes with cable channels and pay movies, and guests can stay connected with WiFi. Pillowtop beds sport premium bedding and the bathroom offers a hair dryer and free toiletries. Other standard amenities include a coffee maker, free weekday newspapers, and a video-game console. At Stewart Hotel, guests have access to a fitness center, free WiFi in public areas, and a 24-hour business center. Parking is available for USD 85 per night (USD 90 per night for valet parking), and there's also an area shuttle for a fee. Multilingual staff at the front desk are standing by 24/7 to help with dry cleaning/laundry, tours or tickets, and securing valuables. Additional amenities include express check-in, express check-out, and free newspapers. Stewart Hotel offers 618 air-conditioned accommodations with laptop-compatible safes and video-game consoles. Pillowtop beds feature premium bedding. Smart televisions come with premium cable channels and pay movies. Bathrooms include showers, complimentary toiletries, and hair dryers. In-room wireless Internet access is available for a surcharge. Business-friendly amenities include desks, complimentary weekday newspapers, and phones. Additionally, rooms include coffee/tea makers and irons/ironing boards. Housekeeping is offered daily and hypo-allergenic bedding can be requested. Niles - This restaurant specializes in international cuisine. Guests can enjoy drinks at the bar. A children's menu is available. The property allows pets in specific rooms only and has other pet restrictions (surcharges apply and can be found in the Fees section). Guests can arrange to bring pets by contacting the property directly, using the contact information on the booking confirmation. Parking height restrictions apply.